The de Broglie hypothesis states that particles of matter also had wavelengths and could behave as waves, just as photons did. String theory will later say that both types of particles — matter and energy — are manifestations of vibrating strings, but that’s about 50 years down the road from de Broglie’s time. He proposed his theory in 1923. Here was de Broglie’s line of reasoning for the bold new theory. Under special relativity, matter and energy were different manifestations of the same thing. The photon, a particle of energy, had a wavelength associated with it. Therefore, particles of matter, such as electrons, should also have wavelengths. His PhD dissertation set out to calculate what that wavelength (and other wave properties) should be. This behavior showed that whatever quantum law governed photons also governed particles. The wavelength of particles such as the electron is very small compared to the photon. For larger objects, the wavelength is even smaller still, quickly becoming so small as to become unnoticeable. This is why this sort of behavior doesn’t show up for larger objects. If you flung baseballs through the two slits, you’d never notice an interference pattern. Still, this left open the question of what was causing the wave behavior in these particles of energy or matter. The answer would be at the core of the new field of quantum mechanics. You can picture the problem if you look at the way the experiment is set up in this figure. The light wave passes through both slits, and that’s why the waves interfere with each other. 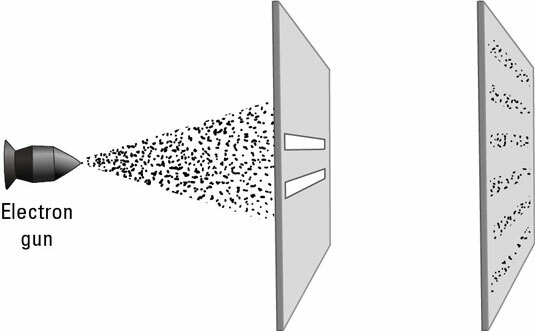 But an electron — or a photon, for that matter — cannot pass through both slits at the same time if you think of them the way we’re used to thinking of them; it has to pick a slit. In fact, if you close one of the slits, this is exactly what happens. 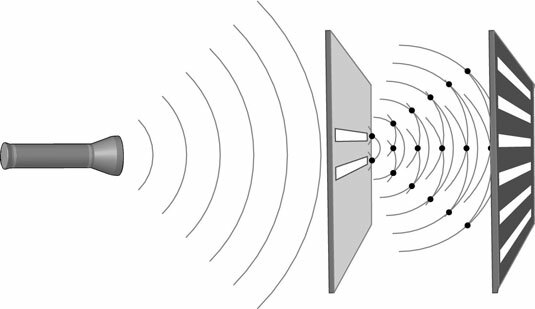 When a slit is closed, the interference pattern goes away — the photons or electrons collect in a single band that spreads out from the brightest spot at the center. So the interference patterns can’t be explained by particles bouncing off the side of the slits or anything normal like that. It’s a genuinely strange behavior that required a genuinely strange solution — in the form of quantum mechanics.